If we as Christians accept the evil of this world as both inevitable and beyond our control, we lose our desire to fight it. That is exactly where the devil wants us: apathetic, ineffective and conquered. Author and veteran prayer leader Tommi Femrite offers winning strategies to help prayer warriors defeat Satan's forces and reclaim each of the Seven Mountains of society: Family, Religion, Government, Business, Education, Arts and Entertainment, and Media. Her powerful insight will help intercessors appreciate their value and understand their mission, while her targeted prayers will empower them to stand in the gap for those ascending each mountain. Invading the Seven Mountains With Intercession will inspire you to reclaim your world for the kingdom of God. 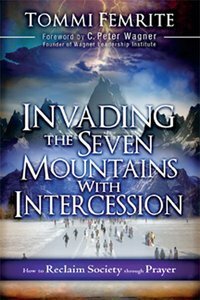 About "Invading the Seven Mountains With Intercession"
Customer Reviews For "Invading the Seven Mountains With Intercession"
A must read for anyone who considers themselves an intercessor and even those who are not sure. Wonderful keys to pray for breakthrough in the 7 mountains as taught by Lance Wallnau. Insightful prayers, declarations, decrees and proclamations will add more tools to the tool belt. As far as I am concerned this would have to be MY read of 2012. I can't wait for her other book (Intercessors Know your prayer Power) to arrive in my letterbox she was so accurate with her teaching.